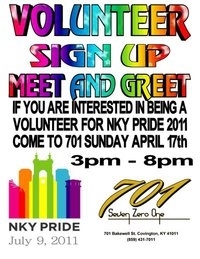 Come out and meet the organizers of this years NKY PRIDE and sign up to be a volunteer on one of our committees. We will have great gifts to raffle off and split the pot to raise money for NKY PRIDE. Even if you can't volunteer still be sure to come out and get a sneak peek at some the fun things we will have to look forward to this year. NKY PRIDE WILL BE SATURDAY JULY 9 this year so lets get ready!! Receive headlines and links to each HOT NEWS story live, in real time, at twitter.com — follow @CincyGLBT.